During WWII, Germany was the first nation to operationally use a number of then-advanced weapons. Many of these were developed by Germans as well and are things which are pretty much taken for granted in today's world. Two of these were the cruise missile and the ballistic missile. We know these better as the V-1 and V-2, though officially they are the FZG-76 and A-4. As with many weapons put into use during the mid-late war period, it was hoped by Hitler and his bunch that they would prove to be so devastating as to turn the tide of the war (which at that time was not going too well). As with many weapons developed and put into operational use, they did not and used resources that could have been better used elsewhere. To provide a bit of a refresher, the V-1 was powered by a pulsejet, which basically dumped fuel into a chamber where it was ignited and provided thrust. However, for it to get enough air, it had to have a boost. Sort of like a ramjet. The Germans never did develop proper solid boosters so this missile required a long ramp to get to speed and that speed was provided by a piston that pushed the missile to where the engine would properly provide thrust. It also meant a somewhat expensive and difficult to hide launch site. The V-2 on the other hand, while quite large, could be launched from just about anywhere and was using mobile launch equipment. The German Army also chose to pick the launch sites for these missiles in the middle of populated areas in occupied territory, thereby reducing the Allies ability to blow the site (and surrounding area) to bits as the casualty rate would have been too high. Most V-2s were launched from the Hague so you can see the conundrum. There were other V weapons such as a very long gun that had charges fired as the shell travelled through the barrel. This meant a fixed site that was limited to aiming at one target. London was the main choice as with the other V weapons. This never reached operation as the site was bombed quite frequently. This book goes into the operation to discover and reduce the threat of the V-1 and to some extent the V-2 and the big gun. When starting the V-1 sites, it was envisioned to have everything done at one place. It meant a large complex and a lot of building. It did not take long for the Allies to get wind of this. These large sites, despite super thick reinforced concrete structures that were basically bomb-proof were rather quickly made moot by turning the area surrounding them into a moonscape and not allowing equipment to get into them. The somewhat smaller 'ski' sites were also easy to find. It wasn't until even smaller somewhat more well hidden sites were developed that the V-1 assault could begin. Of course, the Normandy invasion eventually meant that these sites were over run and V-1 operations were finally too far from London, though there were attacks on Paris and Antwerp. The author does a great job of telling the story. His insights into the politics of the situation (and there was a lot of in-fighting between various factions in the USAAF and RAF as well as between each other) helps us to understand the trials and tribulations of the Allied response as well as the changing tactics. There are a lot of great photographs and the art work and illustrations are super helpful in telling the story. 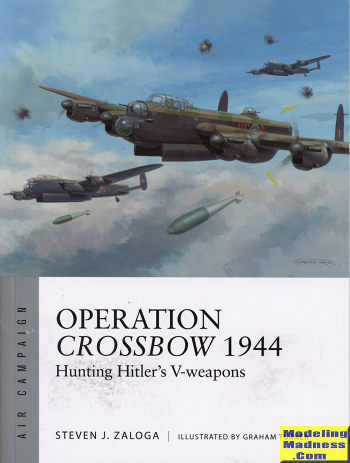 It is a book that enthusiasts of this area of WW2 should have on their shelves. Highly recommended. For more on the complete line of Osprey books, visit www.ospreypublishing.com .